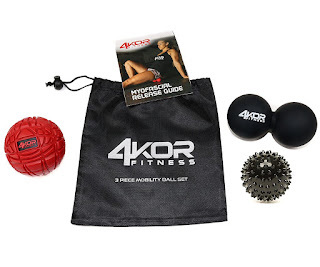 The 3 piece Massage Ball Set from 4KOR Fitness was thoughtfully designed and provides 3 different styles of massage balls in order to release tight muscles on any part of your body. The double lacrosse ball, also known as the peanut lacrosse ball, is the perfect replacement for the homemade tennis balls-taped-together tool that so many people use for self massage. The peanut lacrosse ball is easier to use for many things than individual balls since it doesn’t squirm around and is designed to stay where you want it to without rolling away. The peanut lacrosse ball straddles your spine so you can roll it right down the center of your spine and loosen the erector spinae muscles that easily tend to tighten up. The single fireball is great to use on hard to reach muscles where the peanut lacrosse ball would not work effectively. We designed our spiky massage ball to have enough give that it won’t be too hard and painful to use effectively. The 3 piece Massage Ball Set also comes with the signature 4KOR Fitness customer service guarantee. If you need us, we'll be there with a quick and friendly response every time. Whether it's offering a refund or fitness tips, we'll do anything we can to ensure your satisfaction. 3 Massage tools for only $27! The FireBall is a groundbreaking massage ball that is designed to go where your basic lacrosse balls can’t—creating higher global shear pressures for an intense, effective, and efficient brand of deep tissue therapy. The FireBall is a robust new redesign of one of the most popular recovery products the lacrosse ball. This tool offered by 4KOR is an alternative to traditional foam rollers and massage balls, with an improved nylon frame construction, grip-strong tread, and an innovative, groove pattern for deep tissue therapy. Use it after a workout, before bed, or during a lunch break to treat or prevent knots and soreness. The Fireball goes anywhere, works everywhere, and helps just about anybody recover faster to get back in the gym sooner. Since I have been doing my own soft tissue release I like to think: “More shear, more better, more awesome,”. The balls are VERY HARD, so be aware of that. They work great for getting into those hard-to-reach muscles in your lower back. I think they take some getting used to, and you have to play around with them at first to find how they work best for your body. One of the things I love about the Peanut and Fire Mobility balls: they’re small yet crazy effective. The small size allows you to get into those tight areas you normally wouldn’t be able to with a regular-sized foam roller, and doesn’t force you to hold up your body weight the whole time. They’re also small enough to fit in your bag, making them perfect for travel. This little rubber peanut ball-thing is perfect for getting into those tight spots in your calf, feet, neck, hip flexors, glutes and shaped to fit right on each side of your spine. 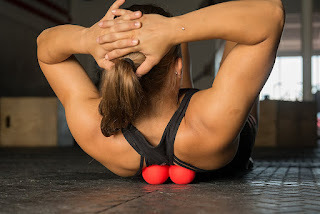 So far my favorite use for the Mobility Balls is to break down the fascia in my feet, to help eliminate the painful areas and inflammation from training for OCR and on my upper back (tspine) to allow my shoulder to get into a better position when throwing or lifting overhead and to counteract the effects of sitting in class for hours ever day. Testimonial from client Taylor C.
"With helpful YouTube videos and these wonder balls, I've able to work successfully on knots that I thought were permanent. Really helps release stored tension trigger points in my shoulders and neck and back. I've found it helps to alleviate intensity of my migraines that begin in those areas too. Great used right before bed, promotes really good sleep for me."